I have written in Clocks magazine before about Isaac Hadwen - in March 1984 and April 1986. But as new information comes to light, it does no harm to re-examine his life and work. To me his earliest clocks are far the most interesting, that is that period of his life when he lived at Sedbergh, high in the wild Yorkshire Dales. These were the remote places Quakers sought, as there they could practice their religion relatively untroubled by neighbours. Isaac Hadwen was born at Sedbergh on the 22nd June 1687, the son of Quaker yeoman, Thomas Hadwen, by his second wife, Eleanor, daughter of Richard Sands of Lancaster. They lived at Fellyeat in Frostrow, within Sedbergh parish. Fellyeate comes from Old Norse, fell being a hillside, yeate (which was Anglicised into gate) was an entrance way or pathway. It was a Viking name, as of course the Vikings settled all over this area, and some are still here. Both his parents died in1697, when he was only ten years old, his father first and mother shortly after. In his will his father expressed he wish that he should be brought up 'in ye fear of ye Lord according to ye principles of light and grace which I have made profession of ever since the Lord gave me to believe therein' – in other words as a Quaker. He left various bequests to his daughter, Alice, by his first wife, 'which her grandfather promised me when I married his daughter, which was never given me'! He appointed supervisors 'in case my wife, their dear mother (being but a sickly woman) should be taken from them'. But he was taken first and the 'sickly woman' outlived him, though only by a matter of months. In her will she passed on properties and inheritances from her husband, who got them from his father and from his first wife's father. 1. The original oak case of this fine thirty-hour clock from Isaac Hadwen's Sedbergh period survives in remarkable condition. The heavy overhang of the hood topmould is characteristic of many early country cases. Isaac probably lived initially with guardians, then later with his step-sister, Alice (born in 1680 daughter of his father by his first wife, Jane Jenkinson), who was married in 1699 to Quaker Thomas Savage of Clifton, Westmoreland. 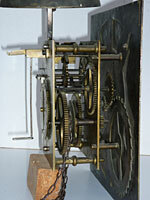 It is unclear if Thomas Savage himself was a clockmaker, but his two sons, Thomas and John, certainly were. Isaac was probably apprenticed from about 1701 to 1708 to John Ogden of Askrigg, Yorkshire, who was also a Quaker. In 1708, at the age of 21, he would have gained his full inheritance including that of the Fellyeat property itself, also known as the 'Side' (meaning Fellside?) in Sedbergh, and that is where he lived from about 1710, perhaps earlier. Isaac was to some extent financially independent and this enabled him to travel far and wide with fellow Quakers to spread the faith and meet other 'Friends', as they called each other. He was documented at a Quaker meeting in Edinburgh in 1711. He was married in 1714 at Settle, Yorkshire, to Sarah Moore, daughter of a prosperous local Quaker minister, Dr. John Moore of Eldroth Hall, near Clapham. Yorkshire. In 1715 they had a son, Thomas, who is recorded in Susan Stuart's researches to have inherited the Gaile property under the will of his grandfather, John Moore, and to have died in 1744; in 1716 a daughter, Eleanor. It was about that time, between 1711 and 1715, that John Ogden moved from Askrigg to Darlington, much further to the east, perhaps to distance himself from what would surely become competition from young Hadwen. Askrigg was only about 20 miles east of Sedbergh, perhaps too close for comfort for two clockmakers, who would now be competing for the clientele of a thinly-populated area. Darlington was about thirty miles further to the east, giving Ogden plenty of elbow room as well as access to the north-east, where other members of his family were based. I always get the impression that earning a living was never uppermost in the mind of Isaac Hadwen. His independent means meant that he did not have to make a full-time living at clockmaking. When he did make clocks, he made some of superb quality, equal to those made by the best clockmakers in the land at that period. His early eight-day clocks are excellent. His thirty-hour clocks a bit more modest. In the end he made what the customer could afford. Yet he always found time for his travels, even if it meant leaving a wife and infant children at home to cope on their own. 2. The ten-inch dial of Isaac Hadwen's Sedbergh period clock, having his favourite verse spelling 'tip' as 'tipp'. He seems to have modified to 'tip' on later dials. Fine original iron hand. The visit to Edinburgh must have whetted his wanderlust appetite. In April 1718 he revealed to fellow Quakers at Sedbergh 'that for a considerable time he had drawings upon his mind to visit Friends in America'. And in fact he did travel to America in May 1718 for a period of six months to visit Friends there, some of whom were relatives (probably including his mother's brother Stephen Sands in Pennsylvania) returning home in the summer of 1719. He kept a journal of some of his travels, which still survives – 'A Brefe Jurnall of a Voige Into Americay Together with Jno. Danson'. He was always better at travelling than at spelling. The journal starts on the 25th May 1718 and ends in July 1719. The party sailed from Gravesend on the Snow Hope to 'Americo', as he spelled it on that occasion, landing in Philadelphia on October 20th.. They visited many Friends, often staying in their homes, visiting Long Island, Jamestown, Nantucket, .... At one time they crossed 'a great marsh that our horsis could Scarce goe upon, it was so full of dangerous holes and soft'. At one time he stayed behind: 'JD (John Danson) was gone to new Yorke where the Small pox had beene, and I did not dare to goe'. The last entry reads: 'This day we were in no good order for travill having bene sore bit at night wth Muscatoes' (mosquitoes). We rid 52 (i.e. rode 52 miles). Lodged at Newhaven.'. It all sounds a bit more exciting than plodding away all day in the northern gloom at the bench making clocks or trudging across waterlogged fells on some windswept hillside to deliver them. In 1720 Isaac was still living at Sedbergh, when his wife gave birth to a daughter, Sarah, their third child, who sadly died in August 1722, the very month when their next child, John, was born at Kendal, a child who unfortunately died within four months. We know it was between late 1720 and mid 1722 that the family moved to live in Kendal, in Westmoreland. The lonely fells around Sedbergh had lost their appeal. It was customary for Quakers to provide a letter of introduction when Friends moved home and therefore attended a different chapel or group of worshippers. Researcher Susan Stuart recently discovered an introductory certificate for Isaac Hadwen and family to Friends at the Kendal meeting and this is dated 24th April 1722, which probably pins his move down to between April and August, around mid-summer of 1722. This makes sense for nobody would attempt to move house in winter at the latitude of Sedbergh over appalling roads that at that season would be nigh on impassable. He lived at Kendal till about1735, about which year he moved to Gayle in the parish of Tunstall in Lancashire, where he still owned a family property, an estate in fact that came from his wife's parents. But within two years he was dead. He was just fifty years old. 3. The hood of the clock showing the delicate baluster pillars attached to the door and the cushion mould beneath the top pediment, both characteristic early features. He died during a second visit to America, at Chester in Delaware on the 29th August 1737, some reports said of fever, some said killed by Indians. His grandson, Isaac Hadwen (III), wrote in 1825: 'My grandfather went to America a second time in 1737 to obtain some acquittances from his relations there relative to the Gale estate, which was left by John Moore of Gale to my grandmother, chargeable with some legacies. He landed at Hampton, Virginia, about the 24th of the 3rd Month (24th May) and after having completed his business was about to return apparently in good health as expressed in his last letter to his wife, dated Chester, Pennsylvania 5th month 9th day (9th July), when the most High saw it right to end his labours by attack of fever, his peaceful life ending the 29th of the 6th Month (29th August) 1737'. Was it those mosquitoes again? He had the presence of mind to make a will before he left. I have a copy of it on my desk. It is dated 1st March 1736 (what we would today call 1737). It was proved on the 24th March 1737 (by modern dating 1738). He describes himself as 'of Over Gaile in the parish of Tunstall and County of Lancaster, clock maker,' and basically he left everything to his dear wife Sarah. 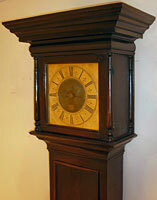 As far as is known the clocks Hadwen made are all longcase clocks. No bracket clock or lantern clock or watch is known by him. After all the longcase was THE staple clock in the rural northern provinces, where no clockmaker was close at hand to keep calling and tending to it. It was sturdy, reliable, not temperamental, and relatively customer-proof as well as being a good timekeeper. Some of his clocks are signed at Sedbergh, some at Kendal, a very few at Gale or Gayle, which he signed as 'Gaile' or 'Gaille'. His Sedbergh clocks are obviously his earliest ones and, like most young clockmakers just starting his career, it seems to me that he put his greatest effort into those. He was initially keen to set a standard and demonstrate his abilities, show off his skills, and this he did excellently. I have kept a note over the years of those clocks I have come across by him. I have documented only nine clocks from his Sedbergh period, which lasted at most about twelve years; a considerable number more made when he lived at Kendal, which was over a period of thirteen years; and only two made when he was at Gayle, which was for about two years. We can understand that in his latter two years he may have regarded himself as semi-retired. But why the big difference between his Sedbergh period and that at Kendal? Well, we don't really know when he began work at Sedbergh and it may have been as late as 1714, which would make his working period there only a span of eight years. It may also be that he found difficulty starting up his business from scratch, whereas by he time he had moved to Kendal his reputation was well established. We know he had apprentices during his Kendal period, and perhaps journeymen too, which may have helped boost his output. In 1727 he took apprentices Isaac Bispham and Thomas Fawcett. In 1730 he took as apprentice William Clark, son of Joseph Clark of Lambrigg. In 1733 he took as apprentice Fryer (Tryall) Rider, son of Edward Rider, hosier of Manchester. 4. The movement of the clock is superbly made and has a calendar wheel offset to one side, a characteristic of clocks from this region, but exceptionally unusual in having a twenty-four-hour drive wheel. His early clocks are much like those of John Ogden in that he copied a feature first used by Ogden in having a verse in the dial corners rather than spandrels. It is said that Quakers did not care for the spandrels that contained human faces, as almost all early ones did, because of the doctrine against 'graven images'. How true this is I cannot say, as both Ogden and Hadwen increasingly did use spandrels containing faces, especially in their later work. It may have been that a skilled engraver could well perform his own corner engraved verses instead of having to send away for, and pay out good money for, cast brass spandrels. Quakers delighted in economy and usually followed that philosophy best expressed by a tight farmer friend of mine ' When you get a pound, make it a prisoner!'. Some would call it being canny, others being a miser. Either way it made for very interesting clocks. Dial corner verses were used by three or four clockmakers, all offering a similar ode to doom and gloom, the message, contrary to that of the modern song, being: 'Don't enjoy yourself, it's later than you think'. Some of Isaac Hadwen's clocks even have Ogden's own verse - at least the first clocks on which it is recorded were by him, so we attribute this verse to him. Engraved in the corners runs: 'Behold this hand, Observe ye motion's tip, Man's precious hours, Away like these do slip'. Ogden used this verse from about1690, perhaps earlier. Initially Ogden had 'motions tap', but very soon changed it to 'tip', which rhymed with 'slip'. Ogden also soon changed to 'the motion's tip' rather than 'ye motion's tip', but Hadwen stayed with 'ye'. Within a very few years after Ogden John Sanderson of Wigton, Cumberland, a Quaker for at least apart of his life, also used corner verses instead of spandrels on some of his clocks. Sanderson, himself a reformed sinner, usually invented his own verses, generally harping on his favourite theme of the repenting sinner doomed to face judgement. Isaac Hadwen copied Ogden's verse, but we know that spelling was never his strongpoint, and on two of his very earliest clocks he spelled the word as 'tipp' with two ps - after which someone no doubt corrected him and he wrote it as 'tip'. His eight-day clocks have two hands of course, yet he still used the verse 'Observe this hand' in the singular. 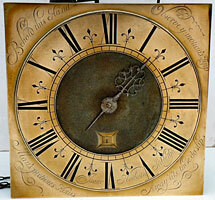 One Sedbergh clock by him has been noted with this verse: 'Winged Time, will not stay, Fleeting hours, glide away'. Another has 'Minutes glide o'er, Hours spend apace, Time posts away, To end our race'. In the end all I can say with certainty from those I have seen is that is Sedbergh clocks have verse corners but once he went to Kendal his clocks have cast brass corner spandrels. Why he changed, I can't say. Perhaps by the 1720s customers were used to spandrels and he obliged them. I know of nine clocks from his Sedbergh period, four being eight-day, five being thirty-hour. Two thirty-hours, which are clearly from his Sedbergh period, are signed without any place name, one just 'Isaac Hadwen', the other 'Isaac Hadwen Fecit'. The rest are signed at Sedbergh. The great majority of his earliest clocks are not in their original cases. This is hardly surprising as very few longcase clocks made by any maker before 1720 are. Age, rot and woodworm have eaten into many cases of this age. I know of one Hadwen clock the owner bought in he 1940s, where the case had been in a damp cellar and the body had totally rotted away but the hood had survived. That clock now hangs on a wall in its original surviving hood, in the manner of a hooded clock. But Hadwen is such an interesting maker and his clocks so beautifully made that owners treasure them, even when fate has meant they have been re-cased at a later date. First published in extended form in Clocks Magazine.